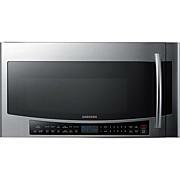 Modernize the look and function of your kitchen with the Samsung 30 In. 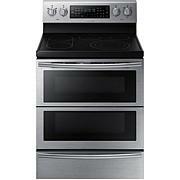 slide-in electric range with Wi-Fi. 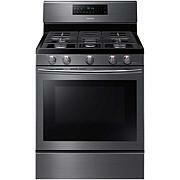 It features a smooth-top 5-element cooktop and a large oven capacity. 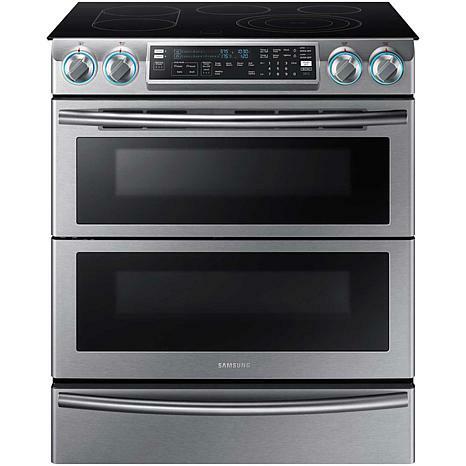 Whipping up large meals with multiple dishes will be no trouble at all thanks to this oven's spacious 5.8 cu. ft. oven capacity, which can be further divided into 2 smaller ovens using the Flex Duo Divider. Cook homemade pie in the upper oven (2.4 cu. ft.) at one temperature and succulent pork roast in the lower oven (3.3 cu. ft.) at another temperature without missing a beat. Dual oven doors give you direct access to each cooking space so you can check on one item without disrupting the progress of the other. 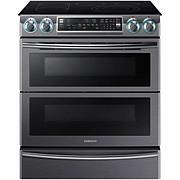 Flex Duo convection fans bring true convection cooking to both the upper and lower ovens. This ensures even-heating for consistent baking, especially useful for when you want that batch of homemade cookies to come out a golden, crispy brown on the outside but still soft and fluffy on the inside.